Yamba is a town in northern New South Wales, Australia at the mouth of the Clarence River. To find photos, traveler tips, maps, and other tourist information, use the Yamba driving holiday planner. Melbourne to Yamba is an approximately 8.5-hour flight. You can also drive. While traveling from Melbourne, expect somewhat warmer days and about the same nights in Yamba, ranging from highs of 24°C to lows of 7°C. You'll set off for Noosa on the 23rd (Fri). Kick off your visit on the 24th (Sat): get great views at Laguna Lookout and then tour the pleasant surroundings at Noosa Main Beach. 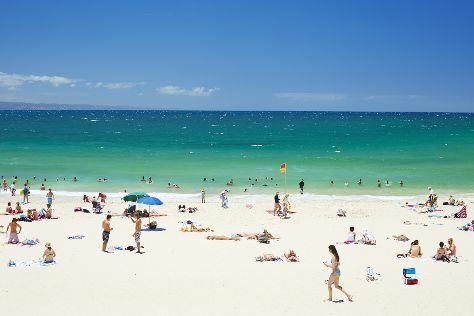 To find more things to do, where to stay, photos, and tourist information, read Noosa online vacation maker . You can drive from Yamba to Noosa in 5 hours. On the 24th (Sat), wrap the sightseeing up by early afternoon so you can travel back home.